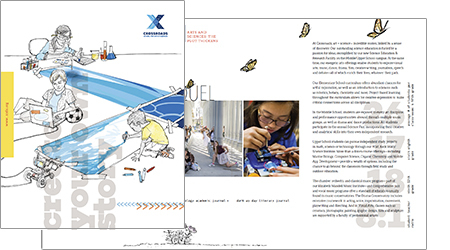 The Viewbook for Crossroads School for Arts & Sciences goes multi-layered to capture the eclectic spirit of an independent school. Art direction: Linda Warren, Warren Group | Studio Deluxe. his is Exploration Central—animated, inspired, nurtured—where learning is fun and questioning valued. Picture a multitude of intersections on a daily basis. Turn a corner down a hallway, and you discover a student jazz band riffing. An impassioned debate over global warming. Or fifth-graders rehearsing the lines of Shakespeare. In a theater green room, calculus class, or ceramics studio, in the library, in a dance studio, on the soccer field—everywhere you look, someone is making something. A life. A future. A story worth telling. The energy is contagious. There's a sense of performance, a musical score accompanying life at Crossroads, with a hum and a beat all its own. You can feel it in the Alley, the nucleus of the Middle and Upper schools, and Crossroads' town square. All roads come together here and venture out again. You may see a dancer shooting hoops with members of the basketball team. Nearby, students and teachers compare notes on a robotics experiment while student editors hand out the award-winning news magazine. At a sun-drenched picnic table, a Latin instructor reviews translations with a student as a group of her classmates paints a mural nearby. On both campuses and in all three divisions, every student carves out a space to dream big, grow and excel.